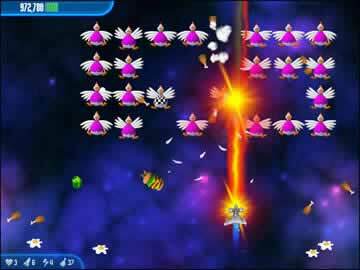 Chicken Invaders Game Review - Download and Play Free Version! "Mr President, the Chickens...they're....they're HERE!" No options to change controls, difficulty, etc. Act Now or Get Scrambled! "Situation critical. You are our best pilot. Launch immediately on an intercept course to the closest attack wave. 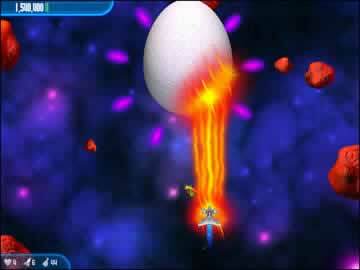 Destroy all alien chicken life forms you encouter flapping wildly in space. Incinerate them. I want to see nothing left but DRUMSTICKS! Oh, and soldier, don't eat the eggs...whatever you do, DON'T EAT THE EGGS!" For more galactic, chicken roasting fun you've got to try Chicken Invaders 2 The Next Wave and Chicken Invaders 3 Revenge of the Yolk. Both game offer a lot more weapons, funny cutscenes, and space shooting action than this version. Chicken Invaders is a strange new twist on the classic Space Invaders style arcade game. Chickens are invading Earth and it's your job to pilot a spaceship to take them out and save the world. You'll take on increasingly difficult waves of chickens and asteroids that threaten to destroy Earth. You can face the task alone or play with a friend. Goofy graphics and sounds add an interesting touch to the good arcade gameplay. The gameplay at the heart of Chicken Invaders is very similar to other arcade shooters. 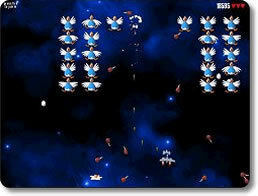 You control a spaceship at the bottom of the screen that can be moved left or right. The enemies sit at the top of the screen, and its your job to eliminate them. However, you'll have to be quick and alert to dodge the eggs they drop. If you get hit by an egg, you lose one of your three lives. When destroyed, the chickens drop a drumstick you can collect for bonus points, or a present that will award you powerups and points. You repeat your actions on wave after wave until you finally lose all three lives and the game ends. There are ten different waves you face in Chicken Invaders. Some waves have you destroying the chicken invaders (who are organized in different formations throughout), while others have you dodging deadly asteroids heading straight for you. The final wave contains a single large chicken invader, and is the boss encounter. Once you complete the ten waves, they start over from the beginning and become more difficult than before. There will be more chickens to eliminate, and more asteroids or eggs to dodge as you progress. You cannot adjust or change the difficulty settings in Chicken Invaders. Similar to the gameplay, the controls are fairly simple. The spaceship you control is moved left or right with the left and right arrow keys (or the A and D keys). You fire with the Shift key, and shoot missiles with the Control key. The controls are given to you before you begin the game, and simple enough for anyone to learn or use. One downside when it comes to the controls is the inability to change them. It would have been nice to change the controls to something easier or more comfortable to use. Another problem with the controls is needing to hit Shift repeatedly to fire. It becomes tiring and repetitive to have to hit the same key over and over. The visuals of Chicken Invaders is hardly cutting-edge, but is on par with other games in the same genre. They also add a somewhat humorous or goofy element to the game. The portrayal of the enemy as chickens and the dropped drumsticks when they are destroyed keep the game a lighthearted affair. The various simple sounds effects also play their part in bringing that feeling to the game, although they may get annoying after hearing them enough times. The biggest issue with Chicken Invaders is the repetitive nature of the game. There are only three types of enemies/obstacles in the game (chicken invaders, asteroids, and bosses) that you deal with time and again. Additionally, the same ten waves repeat over and over as you progress in the game, only change in their difficulty. Having to repeatedly hit the Shift key to continuously fire only adds to the repetitiveness of the game. Playing with a friend (each of you controlling one ship) or working towards new high scores to upload can help offset the monotony, and people really into arcade shooters may not be bothered by the repetitive elements found in many such games. Overall, Chicken Invaders is a decent game with its positive and negative aspects. There's solid arcade gameplay at the core, but the lack of options and repetitive nature may put off some players. The options to play with a friend and upload high scores are nice additions to the game. If you like arcade shooter games, you may find this very fun and addictive. Even if you don't, there's no reason not to at least give the game a try, especially since it's free.